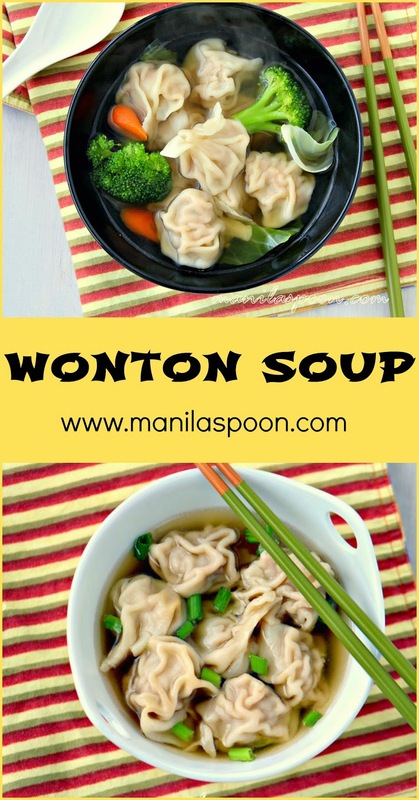 This is seriously a delicious recipe for Wonton Soup – comfort food in a bowl. It’s so easy to make that even my young kids help me when I make this. I am so glad that after several years, I made this truly tasty Wonton soup again today. It was just perfect for the arctic temperatures we have been having the past few days. I am equally delighted that even my kids enjoyed this and hubby especially loved it with rice. I tried it with rice the second time around and I fully understood now why he wanted to eat it this way. The rice soaks up the delicious broth and is so perfect to eat with the delicious wontons. Perhaps we will try it with some noodles next time. Hope this winter you will enjoy this comforting and flavorful soup. It will surely warm you up and make you feel so refreshingly good! You can make the wonton soup on its own without any added ingredients (see photo below). But if you wish to make it more substantial, add extra noodles or vegetables or eat it with rice! Enjoy! Click on the icon below for printing. Choose the image box and check “remove images” for easy printing. *Do not substitute with ground Ginger as this is what really makes the filling delicious. *Hubby and I think there’s no need for extra salt because of the soy sauce and oyster sauce but feel free to add a little, if you wish to. *Use for sealing the wrappers. Mix the pork, oyster sauce, pepper, scallions, rice wine or sherry, soy sauce. fresh ginger, sugar, egg and salt (if using) in a bowl. Use your hands to mix everything evenly. Place a heaping teaspoonful of the meat mixture in the middle of the wonton wrapper. Using cold water, dampen all four sides of the wrapper. Pull all the corners of the wonton wrapper towards the middle and then press firmly until they stick together and are sealed properly. Set aside. There are other ways of shaping the wontons as you can see in the photo. Feel free to be creative. Cook the wontons separately first. This will prevent it from making the broth cloudy as some wontons are covered with extra flour. Bring enough water to a boil. Once boiling reduce the heat to a simmer, drop the wontons in batches and cook for about 4-5 minutes or until they float. (note: they are cooked when they start floating). Remove the wontons using a slotted spoon or simply drain. I want to make this with ground beef. Any idea if it would taste right with the beef, and how do i know if the meat is cooked? It's the same as the pork I can imagine but I haven't tried the beef version myself. If you do, please let us know. Thanks. If your making home made soup…you can put them in your broth when it’s half way done….good luck….enjoy! I mixed pork and beef , added a touch of Apple cider and they are so yummy. Never used oyster sauce before but now I think it will a staple in my kitchen. Great recipe. I am so glad you enjoyed this!! Thanks and I always have oyster sauce in my kitchen as it adds a lot of flavor. When I a was sick as a child, my mom would make Wonton soup. I can not wait to try your version–it sounds like perfect comfort food to me! It's comfort food for me Kristen and hope you like it, too! Thanks! I've never made wontons but am intrigued. Your soup looks delicious and healthy for you. Hope you get to try this Alison! This looks amazing, my tummy is already rumbling just from looking at the pictures! Now THIS is how to serve and eat wonton soup! None of that watery, gummy stuff you get at local Chinese restaurants. I will have to make this soon to curb my craving! Can't wait to make this for my oldest granddaughter. When she was a little bitty she wanted "one time soup" often. Yours looks and sounds like what we would get from the restaurant. TY for the recipe. Thanks for letting us know! So glad you enjoyed it and this is certainly one of my fave recipes on the blog! Hi! I don't like oyster sauce, can I replace it by soy sauce or something else? Soy sauce is already included so if you wish you can just increase the amount to taste. So glad you enjoyed this! Thanks! If I want to freeze some wonton, would you recommend I cook them first? You can cook directly after freezing so no need to cook before freezing. I’m making this recipe in double so I can make a quick soup when needed! It is not my first go with it hence the double batch. This is the tastiest and easiest recipe for wonton I’ve ever had! I’m also trying to comment more and have to say this recipe is so tasty and we love different world flavours that I signed up for your emails! You totally made my day Ann. Thanks for kindly telling us about this. Please enjoy the rest of the recipes. Thanks!